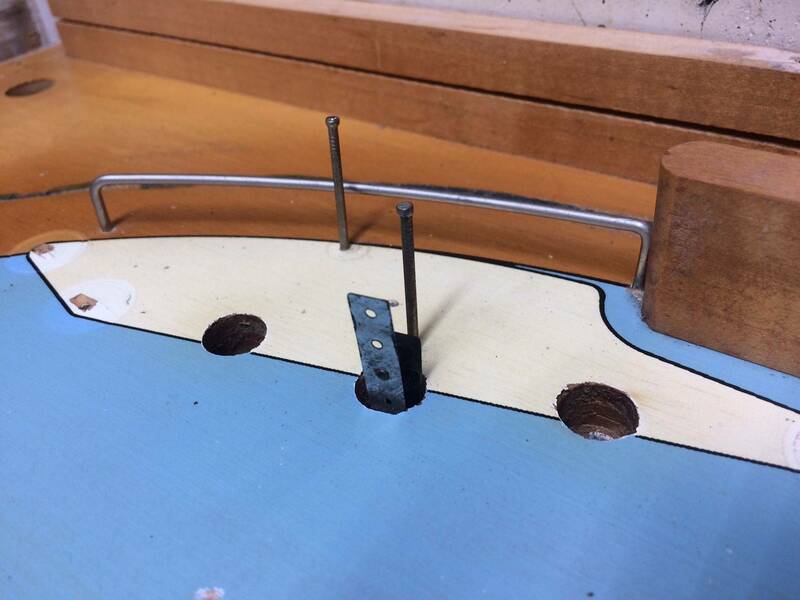 » Forum » Restoration » Playfield restoration » 1968 Gottlieb Fun Land - What kind of top coat was it? » 1968 Gottlieb Fun Land - What kind of top coat was it? 1968 Gottlieb Fun Land - What kind of top coat was it? I've read a lot of posts about top coats and much of Vids guide. I'm wondering if people can help guide me with some basic identification. Attached is a close up of the playfield. I'm trying to determine what the top coat is on this. Looks pretty original to me, and top coat looks like it was brushed on. Anyone know what I'm looking at here? Would the original to pcoat from Gottlieb have brush strokes? I should add that I took some 90% ISO and ME and scrubbed hard on some lower pristine finish. Didn't seem to remove the top coat as I thought it would. Looks like someone brushed can Polyurethane over a slightly planked play field. Great help guys. I'll do some test swabs with different solvents to see what it is. All the dirt is in that top coat, so I'd like to remove it and maybe I'll be able to just wax it or top coat it again. 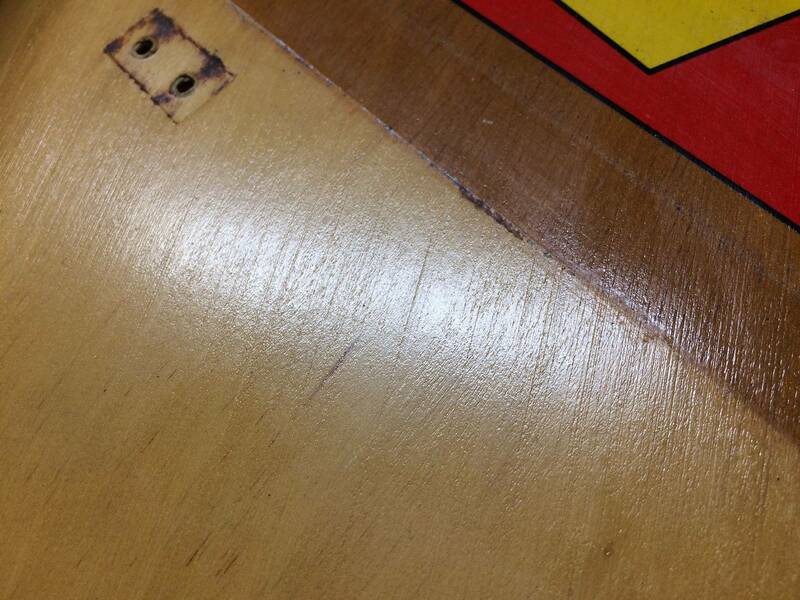 BLUF: There are no "brush strokes" on factory manufactured pinball machine, even as far back as the 1940s. This is private owner aftermarket "improvement". Operators did not do it, because they did not care. Understand that removing this extra layer of non-factory coating (most likely polyurethane, but I would personally take a sample and get it tested) with basic home methods, may break the factory lacquer beneath the coating cause layer peeling, and paint loss within the cracks. Start with denatured alcohol (isopropyl alcohol won't help your cause, because it will not remove anything properly), and a soft terry cloth rag, watch the rag VERY carefully in a corner or a part hidden from basic view. Do not use heavier caustic solvents or you will liquify the extra coating, the original lacquer, and original paint into a gummy hot mess. This could destroy the playfield at worst case, and and best case be hell to try and clean up. Thank you. I'm hoping it's water based poly, but we'll see. I'm using a lot of caution. A little update for anyone who is curious. I tried a few test areas under the metal apron at the bottom. That top coat didn't budge with xylene, which tells me it was not water based. Lacquer thinner cut through it, so likely a non-water based polyurethane. With some careful application, that coating can be cut through without getting into paint. I'm sure at times I got into the original top coat a little, but I'm just trying to get at the suspended dirt in the poly. Results are pretty good so far and I plan to stop at "pretty good" and not push my luck. Then some Novus II, then a good coat of wax. New question though: There are finishing nails behind some of the slingshots. Did gottlieb do this or another "clever" owner? Just an add on, GTB finishing nails were an effective cost effective means to support the plastics. Sometimes you do not need fancy metal pieces to hold them up, unless there is a requirement for a metal lane guide with direct impacts. More manufacturers today should have do same thing based on large plastic designs, although used by Bally and Williams in the 60s, 70s, and 80s. Use PETG washers on the corners of those hard to find plastics, even though ball speeds on EMs are slower. No point in finding replacements, if you do not need to do it.